There is a lot of research that has been done on introverts. 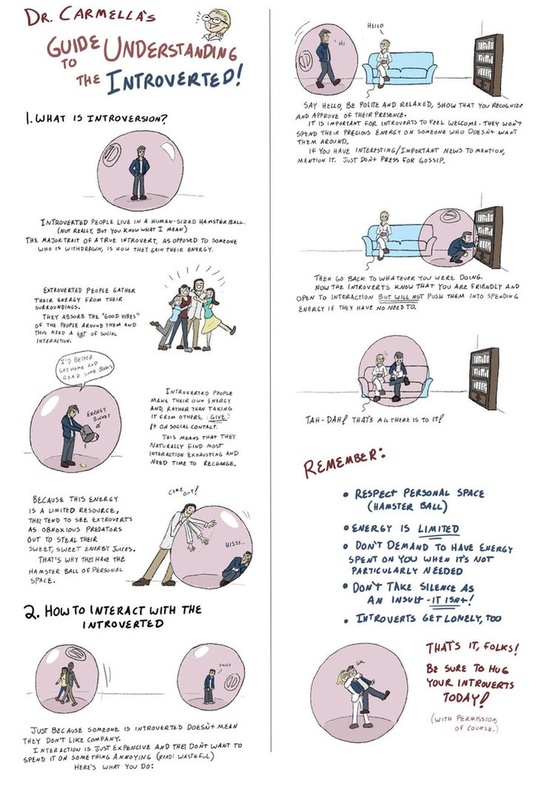 To the left is a short chart on some things to remember about introverts. a) Reading a book she has been waiting for, or b) attending a large party with people she doesn’t know well. a) Trying one or two activities and spending the rest of the day at home, or b) trying as many new activities as possible and staying out all day. a) Spending the afternoon with two close friends, or b) with twenty friends. a) standing away from the crowd to observe at first, or b) jumping right in to socialize. a) talking more softly, looking at people when they are speaking, and not interrupting, but looking away more often when he speaks, or b) talking more loudly, possibly interrupting, and looking at people easily when he speaks. a) speaking hesitantly or appearing to search for words at times, or b) talking fluently and sounding as if he knows more about a subject than he really does. a) standing stiffly or with little physical expression when she first enters a new group of people, or b) standing close to people and using lots of expression and body language right away. If you mostly answered “a,” your teenager is more introverted than extroverted and may need some support from you to thrive in an extroverted world. 1. When the individual has no friends and spends all their time alone… but not by choice. 2.When the individual is depressed about having no friends. 3.When the individual refuses to work with others for any reason. These children who are introverts and extroverts need to be identified so they can be supported. You don’t want some extroverted gifted students dominating all the conversations in a classroom. You don’t also want to have the introverted gifted child sitting in the middle of a conversation not participating. After the student has been identified teachers need to create an atmosphere for both types of students to be successful, feel supported, and comfortable in the classroom. To the left is a cool poster I found online. It has some ways to care for both introverts and extroverts. Take a look. Are you doing these things? If so, how it is working for you? Take a look at your classroom environment. What elements do you do that help to bring out the introverted student? What elements could be changed to help support that student? What elements do you do to help extroverted child not be the dominate figure in the classroom? What are some elements that could be changed to help support the student?